iPin was the first company to use the iPhone’s headphone jack as an accessory port for a compact laser pointer. And not to diminish the fun you can have with a laser, but the company’s latest product is considerably more useful since it turns your smartphone into a full-on laser measure. Based on the company’s announcement video, using the device seems pretty easy. 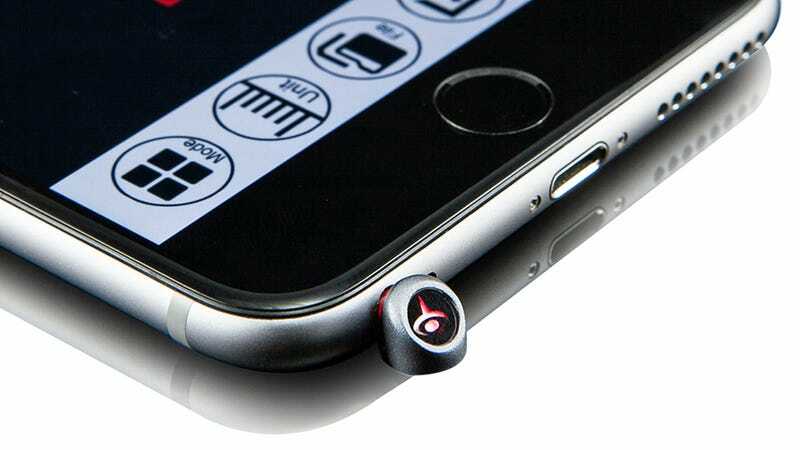 You download a free accompanying app; plug the iPin Spatial Ruler into your iPhone or iPad’s headphone jack; ensure its business end is pointed towards the rear of your device; and then positioning the projected red dot at whatever object you want to know the distance to. At the moment there aren’t a lot of details about how accurate iPin’s Spacial Ruler is, but you can safely assume it falls slightly below more professional and purpose-built laser measuring devices. So naturally, the iPin will almost definitely sport a cheaper price tag, but it’s still worth considering because the gadget takes advantage of your mobile device’s touchscreen for some clever additional functionality. Once an initial distance measurement has been taken, the Spatial Ruler’s app lets you estimate the size of objects in a scene by simply positioning dots around whatever you’re trying to measure. Again, it’s probably not 100 percent accurate, but if you’re trying to determine if a new couch will fit in your living room, the tiny laser measure and its app seems a heck of a lot easier than wrangling an unwieldy tape measure.